Daily Life Archives - Oracle Dental Family-friendly dentist offering the best care on the Gold Coast. If you or your child/children play a contact sport and a lot of us do, you are at risk of injuring your teeth. 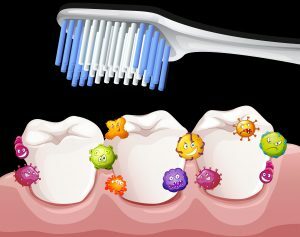 How do we protect our pearly whites? The best way is with a mouthguard. A correctly fitted mouthguard works by absorbing & spreading the impact of a blow to your mouth. They can protect you from some serious & expensive injuries, such as knocked out, fractured or broken teeth, broken jaws, cut lips & tongues. They really are a must & not just for the major contact sports like boxing, hockey or football. Even non-contact sports like netball, soccer & skateboarding carry a real risk of accidental collision or a fall. So now we know how important a mouthguard is, let’s discuss the different kinds. There are two types of mouthguards; over the counter & custom made ones. These guards can be bought from most pharmacies & sports stores, they usually cost around $10 to $45.00. They come out of their packaging as a smooth pre-formed u-shaped tray which covers the top row of your teeth to stop the upper & lower teeth gnashing against each other. The most popular way to fit them is to “boil & bite”. This means that the guard is placed in hot water according to instructions allowing it to soften; it is then placed in the mouth & gently bitten on so it moulds to the wearers teeth. After the guard has cooled you can make adjustments as necessary by cutting with scissors. A custom-made mouthguard is made specifically for the wearer. A dentist will usually make these types of mouthguards. You will need to make an appointment where the dentist will take an impression of your teeth. This is then poured up into a model. From this model your personalised mouthguard is made. Custom made mouthguards are very durable & because they are made exactly to your teeth shape they are extremely comfortable. 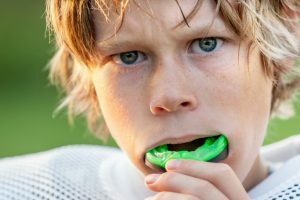 They last a long time, so unless you have a child who is in the process of their dentiton changing, a custom made mouthguard should last a few seasons. Custom mouthguards cost around $165.00 but remember they also last a lot longer. Also, if you are in a health fund, some will cover the entire cost of one mouthguard per year as they regard them as preventive treatment. The item number is 151 if you would like to check with your fund. Other health funds give a considerable rebate which makes them more affordable. Greater monetary outlay compared with over – the – counter. So there you have it, the custom made mouthguard is far superior to its store bought counterpart and let’s face it we only get one set of permanent teeth so we really need to protect them as best we can. A dental x-ray is a fantastic diagnostic tool that dentists use to assist in the diagnosis of dental problems. Let’s face it, our dentists at Oracle Dental are good…. in fact they are really good…. but they don’t have x-ray vision. 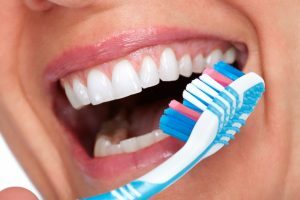 During a routine dental examination your dentist will thoroughly check all your teeth, your gums & the soft tissues inside of your mouth & tongue. However, they cannot see what is happening on the inside of your teeth, between your teeth or in the supporting bone. This is where an x-ray is invaluable! Dental problems picked up on x-rays include decay, abscesses, gum disease, fractures, impacted teeth and pathology such as cysts. We generally recommend taking x-rays approximately every 2 years at one of your regular examination & cleaning appointments. X-rays can pick up very early signs of decay that the eye cannot see yet. 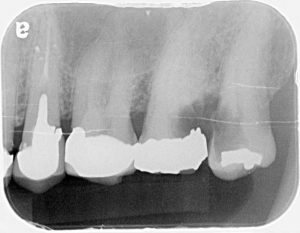 The x-ray also shows us how far the decay or other problem has progressed so that we can then do the appropriate treatment. To put it simply: regular x-rays = early diagnosis = less dental treatment required! See the x-ray below. This patient came in for their general examination; they had no pain or broken teeth. Routine x-rays were taken & detected two large areas of decay that were not visible in the mouth. 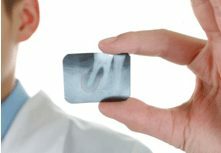 It is good to remember that in the early stages of tooth decay you may feel no pain or discomfort; some people feel none even at an advanced stage, another reason why dental x-rays are invaluable. A patient may come in with dental pain; they can’t exactly locate which tooth it is but it has been tender, sensitive to hot & sore to bite on. In the mouth there are quite a few large fillings but there is no evidence to differentiate which tooth is causing the symptoms. This is where an x-ray is imperative to find out the cause of pain. The example below shows the tooth & its roots. This patient has a dental abscess & the x-ray confirmed it. You can see the dark area around the bottom of the tooth roots, this is infection. This tooth now needs a Root Canal or an extraction. Both could have been prevented with regular dental examinations & x-rays. Many patients are concerned about having x-rays due to the fact that they emit radiation. 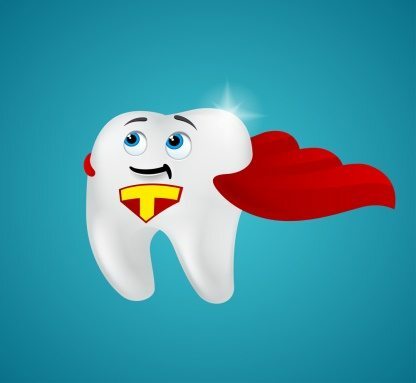 This is one of the reasons we only take them every 2 years(unless you have dental pain) rather than at each 6 monthly exam.However, we should point out that dental x-rays emit an extremely minimal amount of radiation & the new digital x-rays which we use at Oracle Dental emit even less. To put it into perspective, the radiation dose of two routine dental x-rays is less than one day of natural background radiation or about the equivalent of a flight from Brisbane to Sydney. 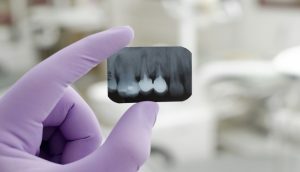 So next time you are due for your examination & x-rays are recommended, you now know how important they are for keeping your teeth and gums in tip-top shape! People spend approximately 1/3 of their lives sleeping. Sleep allows our bodies to rest and repair. Memory and brain function, our immune system and systemic health are directly dependent on our sleep. Many of us do not sleep as long or as well as we should. 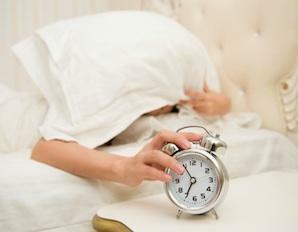 Night time grinding or clenching (bruxism), snoring and sleep apnoea all affect the quantity and quality of our sleep. Fortunately, there are a range of oral appliances (that can be made by a trained dentist) that are very effective in reducing the impact of these conditions. Sleep Bruxism is characterised by grinding or clenching of the teeth during sleep. There is increasing evidence to suggest a relationship between bruxism and sleep disordered breathing (snoring and sleep apnoea) it is possible to both snore and grind your teeth during your sleep. It is estimated that the forces that can be applied to your teeth during sleep can be 3-10x stronger than when you clench while awake. – Drugs -alcohol, smoking, caffeine, illicit drugs. Sleep Disordered Breathing includes snoring and Obstructive Sleep Apnoea (OSA). Snoring is a sign of partial obstruction of the airway by the soft tissues such as the tongue, soft palate, uvula and tonsils. While most of us snore at some time, intensive snoring on a permanent basis significantly disrupts sleep and can be a sign of the more serious condition of OSA. Obstructive Sleep Apnoea occurs when the soft tissues completely obstruct airflow, preventing oxygen from reaching the lungs. When oxygen in the blood falls below a certain level your sleep is interrupted and you will arouse or wake up trying to breathe, sometimes choking or gasping for air. – Heartburn or GORD (gastro-oesophageal reflux disorder). Diagnosis of OSA is made by your medical doctor based on the results of a Sleep Study. Treatment for OSA is dependent on the severity of the condition but in many cases the recommended treatment is construction of an oral appliance that helps to maintain the airway open during sleep. The anatomy of your jaws and soft tissues and the wear patterns of your teeth can be a strong indicator for these conditions and as such, a trained dentist may be the first person to notice the signs and symptoms of bruxism and sleep disordered breathing. Here at Oracle Dental we have Dr Jacki Obst who has a keen interest in Bruxism & Sleep Apnoea. If you have any questions regarding this please call to organise an appointment with her. 07 55317259.